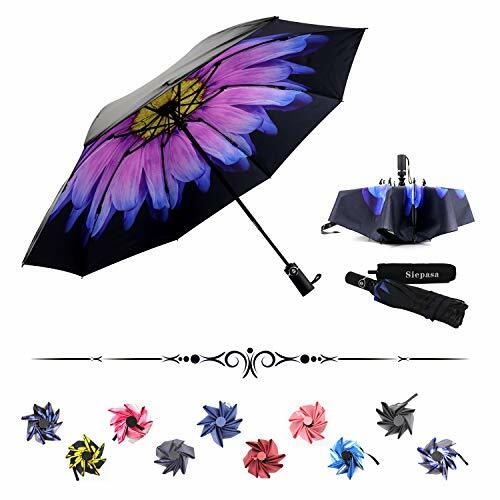 MATERIAL: Made of water-resistant nylon, sturdily constructed, dirt-resistant fabric. 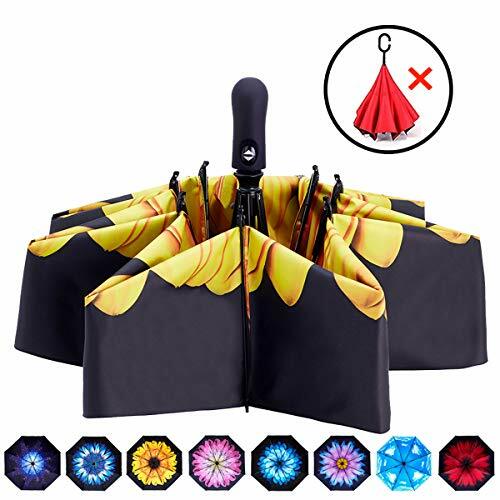 STRUCTURE: 2 front open pouch, one big internal zipper pocket, one big space hold your laptop ,books, wallets, umbrella, water bottle and so on. 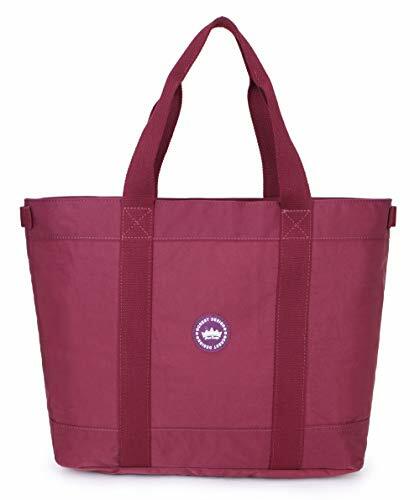 LIGHT WEIGHT: Weighs only 0.4lb, very convenient for you to carry-all for school, travel, work, or shopping. 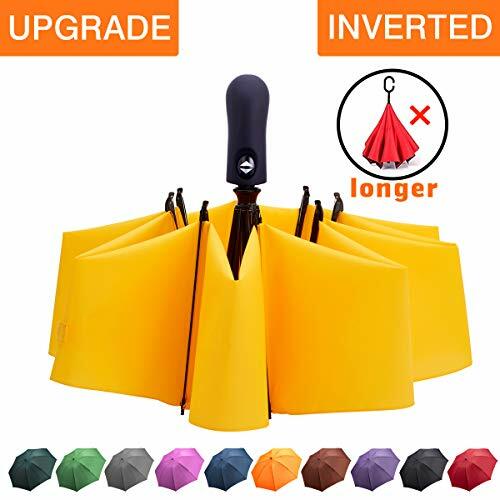 DIMENSIONS: 16.5"x 4.3" x 14.2" (Unfold), 5.9"x 7.5"(Fold) There is one strengthened handle, which is enough for you to carry what you need in your daily life. LIFETIME WARRANTY - We guarantee 30 days return and money back, One year warranty and lifetime customer service. 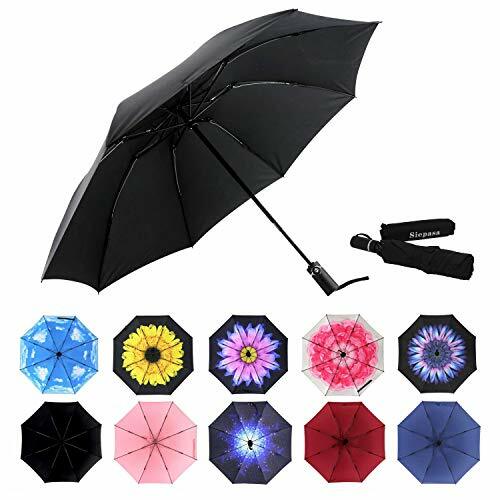 Compact & Ultra lightweight & Portable: This automatic/ reverse / inverted /compact /travel umbrella,at 12.6" when compacted, easily fits in your car, your briefcases, backpacks, travel bags etc. Weighs 14 ounce with a handy wrist string for convenient carrying around. 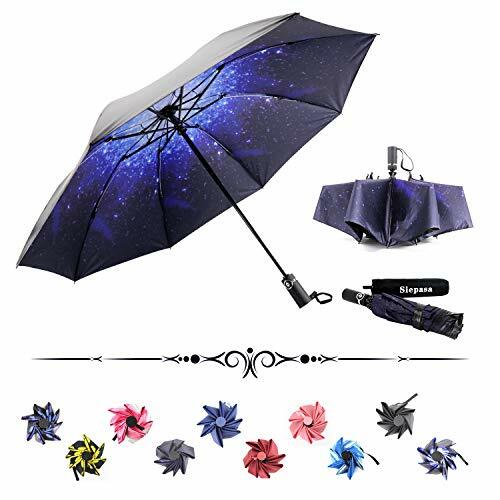 It is perfect for travel, business, camping, fishing, and other daily usage.Suitable for men and ladies. 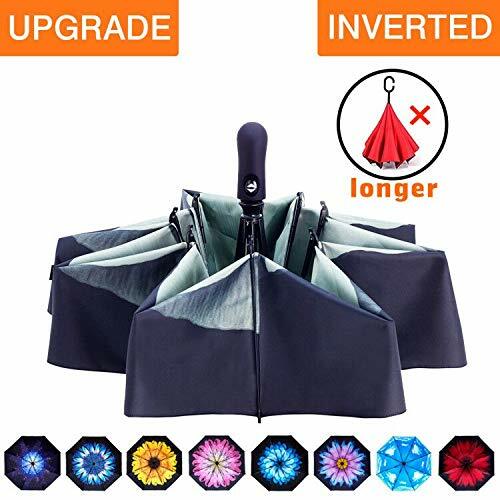 Unique Inverted /Reversed/ Upside down Folding Design: This automatic /upside-down umbrella takes an inside-out design. 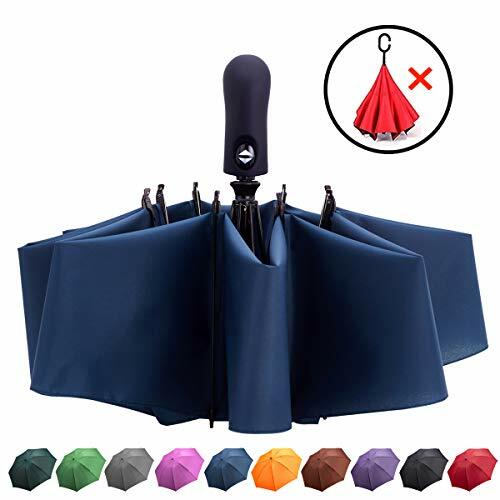 When close it, the wet part will be inside of the umbrella, preventing water from dripping, and it will not get yourself wet when getting in and out of the car, which prevents water from dripping, keeping floors and cars dry. 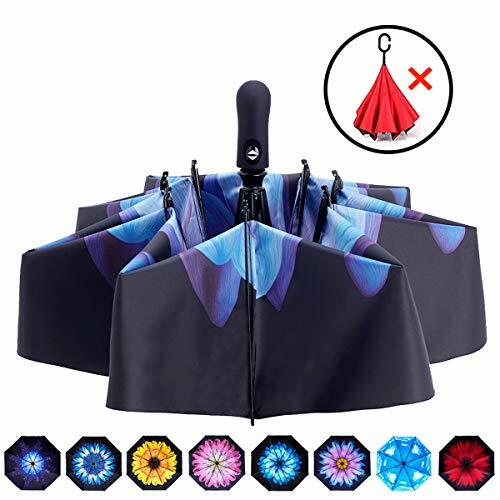 One button for Auto open & Close: This automatic/ reversible / inverted /compact /travel umbrella has a fully automated system, perfect for one hand operation. 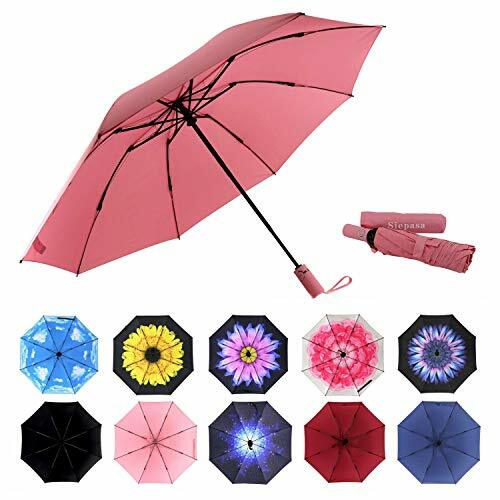 Simply OPEN or CLOSE the umbrella with a press of a button to give you quick rain and sun protection. No more worry when the other hand is full! 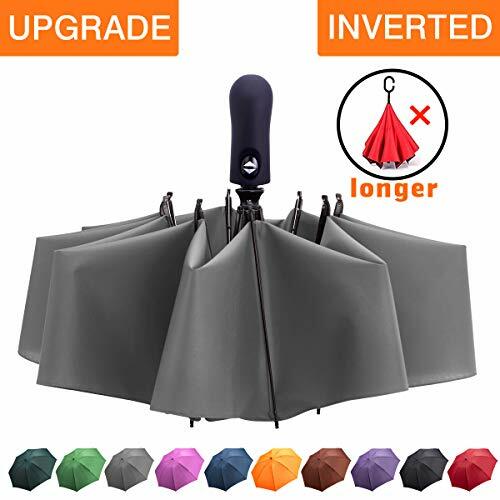 Superior Windproof & Waterproof: The 210T canopy material is used in this automatic reversible / inverted /compact /travel umbrella to repel water easily and quickly, both for rain and sun protection. 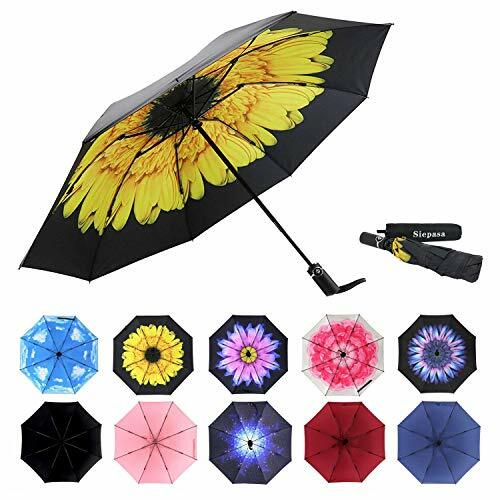 Sturdily built structure with the strengthened black metal shaft and 8 fiberglass ribs, our umbrella is durable and strong enough to last through the strong wind without turning inside out. 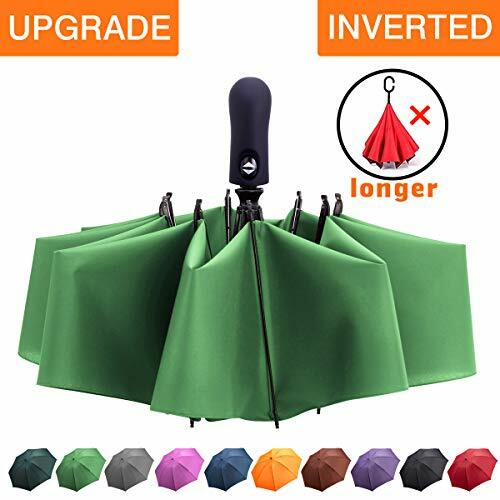 Ideal Gift & Quality Guarantee: This inverted /reverse folding umbrella is perfect for travel, business, camping, fishing, and daily use. Suitable for men and ladies. 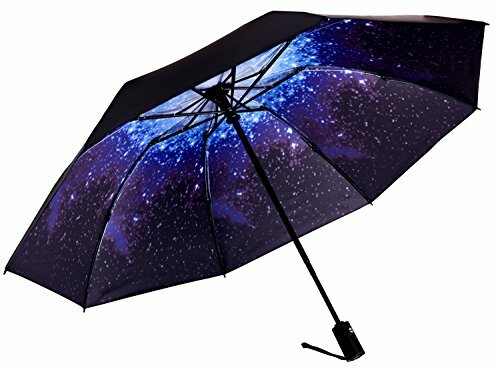 Besides, it's also a creative gift for your parents, friends, colleagues and etc. 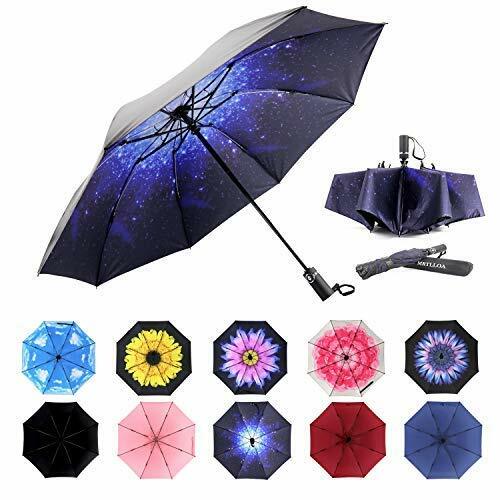 Using this inverted/reverse umbrella, you are always protected from rain, wind and UV. 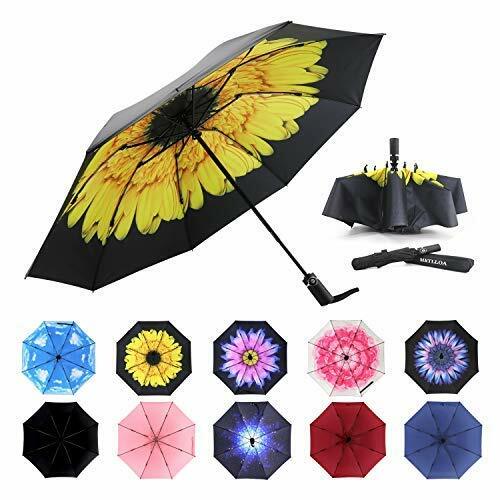 If anything goes wrong with our umbrella, we will send you a replacement absolutely free, no return required. 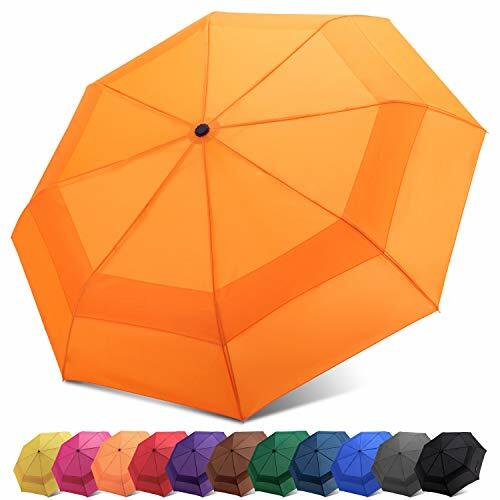 WINDPROOF VENTED DOUBLE CANOPY: This umbrella has a vented DOUBLE CANOPY construction that allows the wind to pass through the vents, preventing it from flipping over or breaking in sudden. 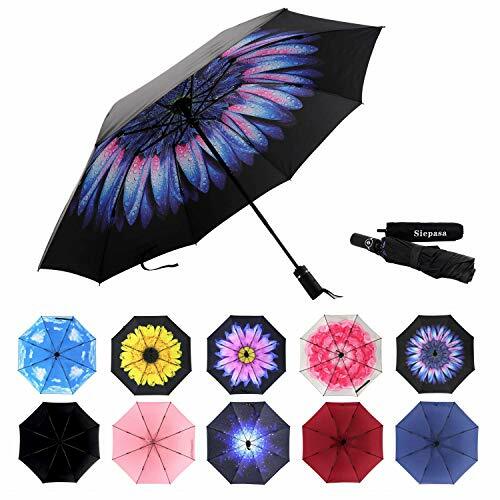 Double layer made of durable black electric enhance its windproof effect, give you more safety and comfort even on terrible weather. 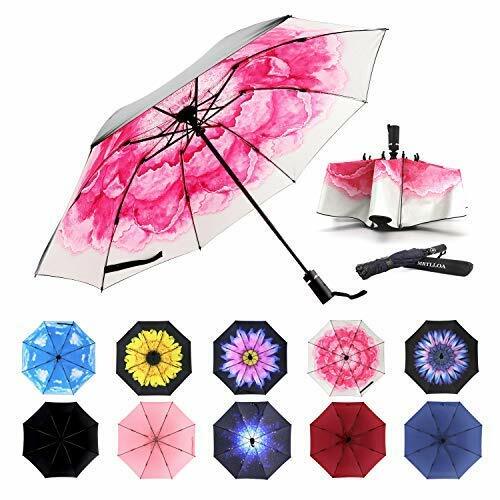 AUTOMATIC OPEN & CLOSE: This umbrella has a fully automated system, perfect for one hand operation. 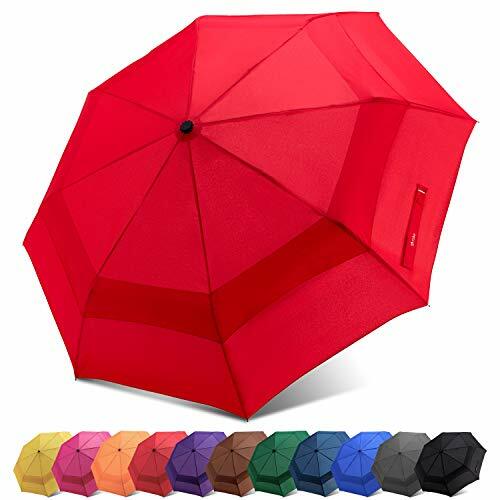 Simply OPEN or CLOSE the umbrella with a press of a button within one second. 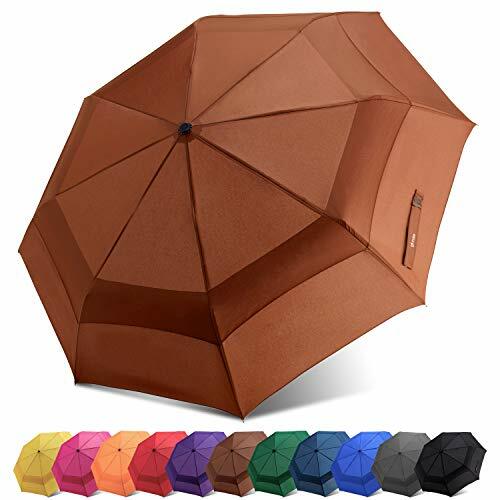 This feature gives you quick rain and sun protection, making sure you have a wonderful time outdoors, no matter the weather. No more worry when the other hand is full! 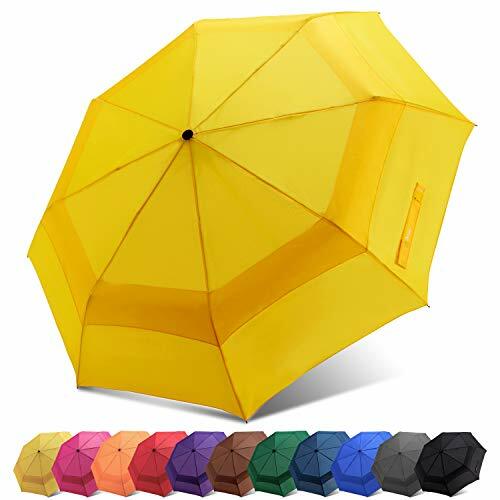 STURDY & HIGH QUALITY: Sturdily built structure with the strengthened black metal shaft and 8 fiberglass ribs, our umbrella is durable and strong to last through the harsh wind. The 210T specially coated water repellent fabric frees it from easy rust and ensures great protection and dryness. 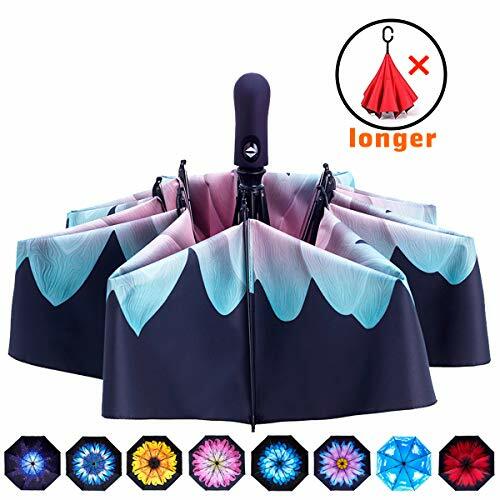 PORTABLE & SUPER LIGHT: A 3 folding telescopic shaft is collapsible to small 11 inches in length yet opens to form a 42 inches large canopy. Such compact and mini umbrella only weights 14 oz, super light and portable to carry with, perfect for briefcase, regular bag, golf bag and more. 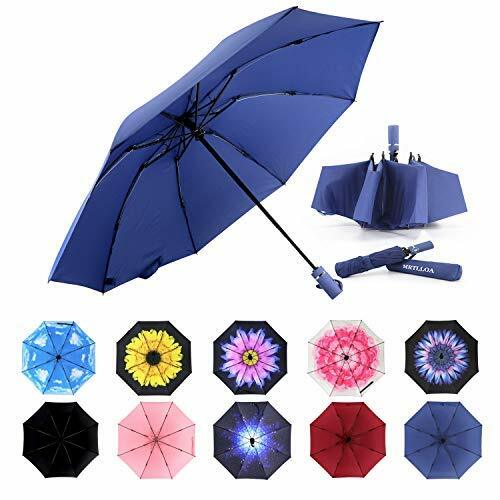 IDEAL GIFT & LIFETIME WARRANTY: Quality craftsmanship with chic design makes Fidus Vented Auto umbrella an ideal gift for your family, friends and colleagues, etc.. An unconditional Replacement/Refund is PROMISED if you experience any issue with our umbrella. 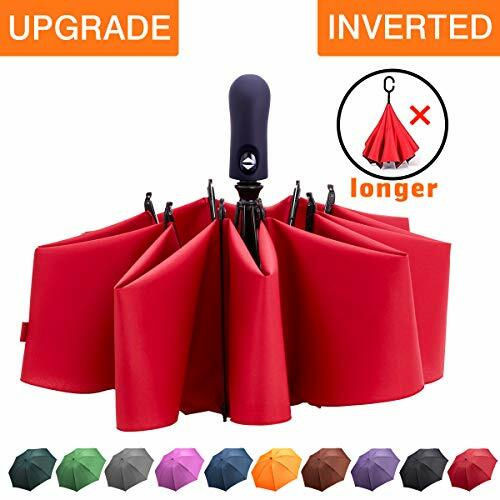 PORTABLE & COMPACT: A 3 fold telescopic shaft is collapsible to a mini 11" in length yet opens to form a large 46" canopy. Easy to carry without taking much space. Suitable for women men for travel and outdoor activities. .
PORTABLE & COMPACT: A 3 fold telescopic shaft is collapsible to a mini 11" in length yet opens to form a large 46" canopy. Easy to carry without taking much space. 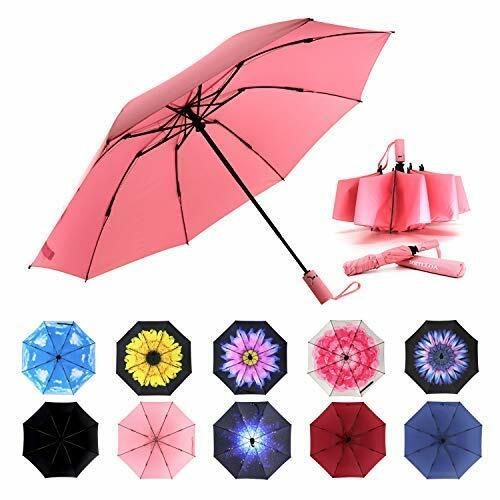 Suitable for women men for travel and outdoor activities. Compact & Ultra lightweight & Mini: At 11.8" when compacted, easily fits in your car, your briefcases, backpacks, travel bags etc. Weighs 14 ounce with a handy wrist string for convenient carrying around. 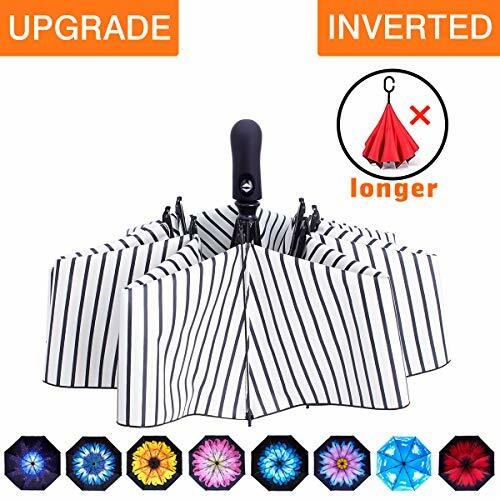 Unique Inverted /Reversed/ Upside down Folding Design: This upside-down umbrella takes an inside-out design. 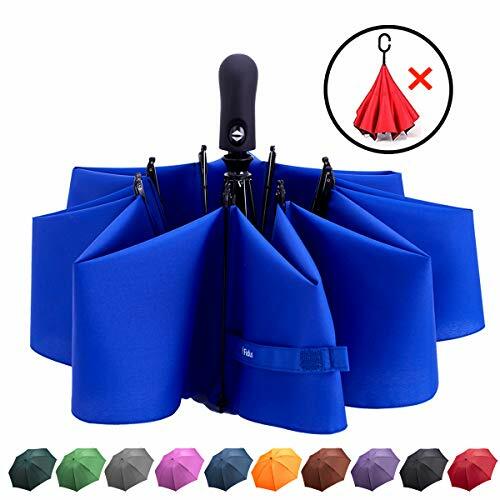 When close it, the wet part will be inside of the umbrella, preventing water from dripping, and it will not get yourself wet when getting in and out of the car, which prevents water from dripping, keeping floors and cars dry. 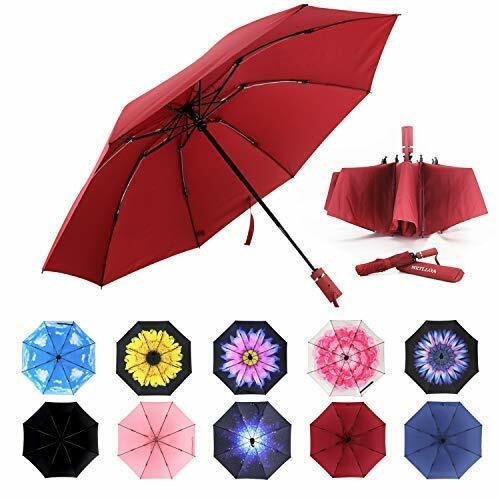 One button for Auto open & Close: This umbrella has a fully automated system, perfect for one hand operation. 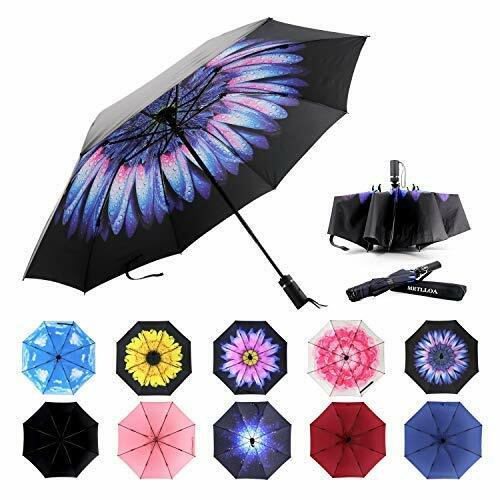 Simply OPEN or CLOSE the umbrella with a press of a button to give you quick rain and sun protection. No more worry when the other hand is full! 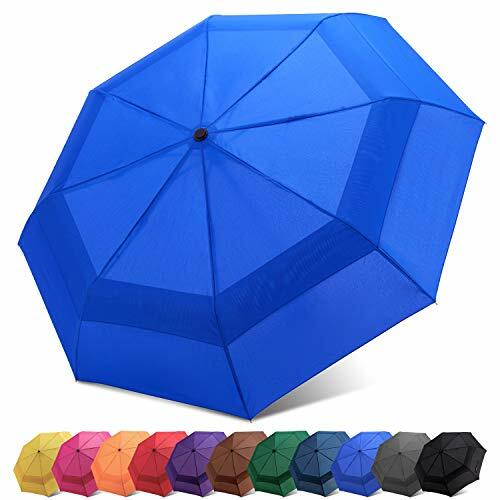 Superior Windproof & Waterproof: Select 210T canopy material enables this umbrella to repel water easily and quickly, both for rain and sun protection. 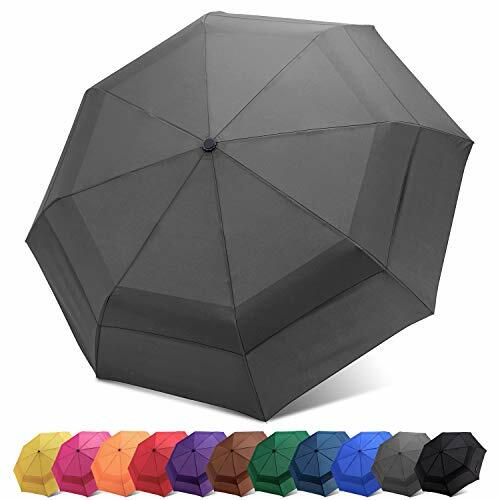 Sturdily built structure with the strengthened black metal shaft and 8 fiberglass ribs, our umbrella is durable and strong enough to last through the harsh wind without turning inside out. 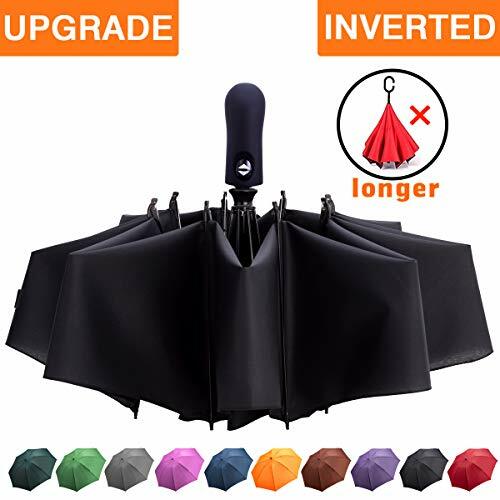 Ideal Gift & Quality Guarantee: This inverted /reverse umbrella is easy to store in your car, your briefcases, backpacks, travel bags etc. 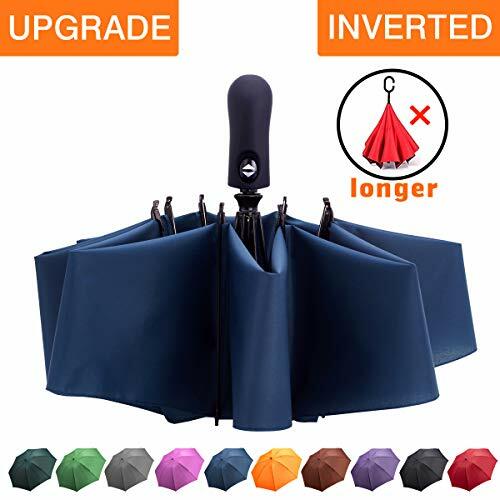 It is perfect for travel, business, camping, fishing, and daily use. Suitable for men and ladies. 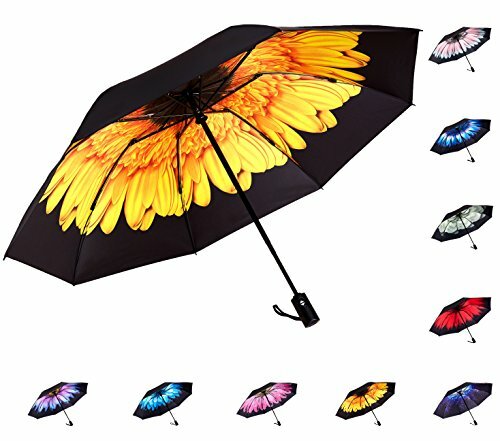 Besides, it's also a creative gift for your parents, friends, colleagues and etc. Using this inverted/reverse umbrella, you are always protected from rain, wind and UV. 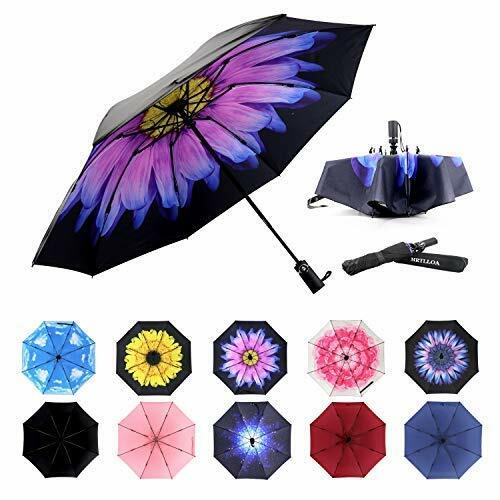 If anything goes wrong with our umbrella, we will send you a replacement absolutely free. 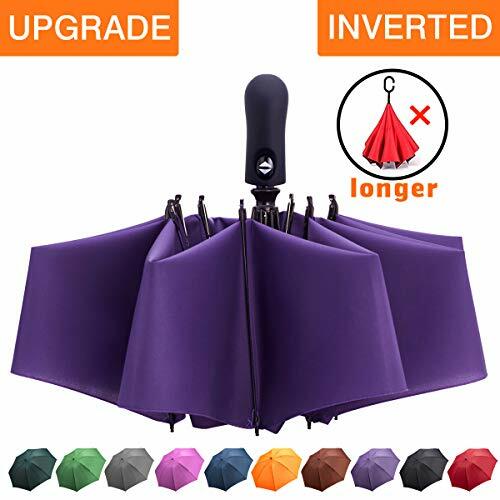 PORTABLE & COMPACT: A 3 fold telescopic shaft is collapsible to a mini 11" in length yet opens to form a large 42" canopy. Easy to carry without taking much space. 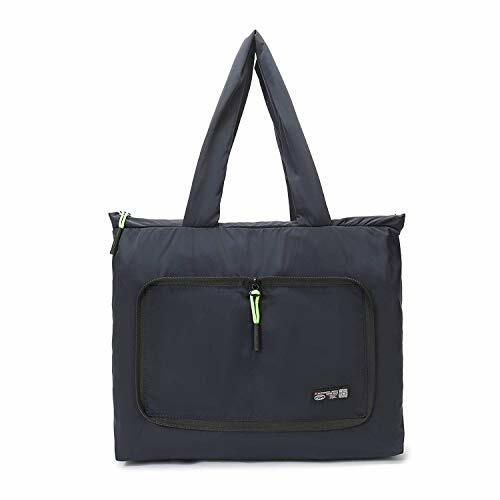 Suitable for women men for travel and outdoor activities. .
Material: Made of premium vintage-wash water-resistant nylon with heavy-duty hardware; sturdily constructed, with detailed streamlined stitching and fully lined with polyester fabric. 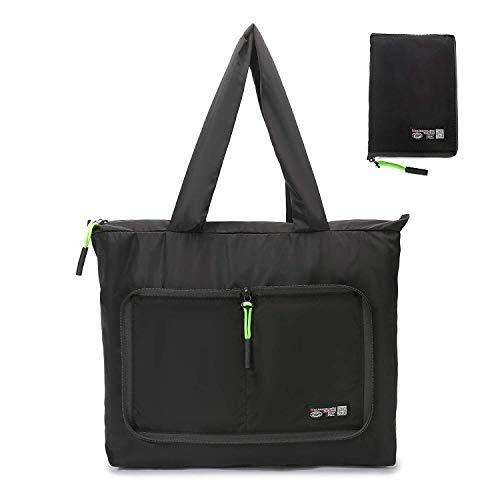 Large Capacity: Full length top zippered main compartment with an internal organizer compartment that contains a padded laptop compartment (fits laptops up to 17"), two inner slip pocket, elastic mesh organizer and one cup holder. 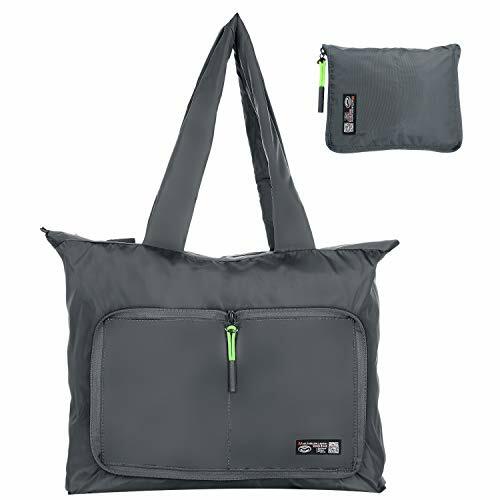 Light Weight: Less than 1 lb; easy carry-all for work, travel, school, or shopping. 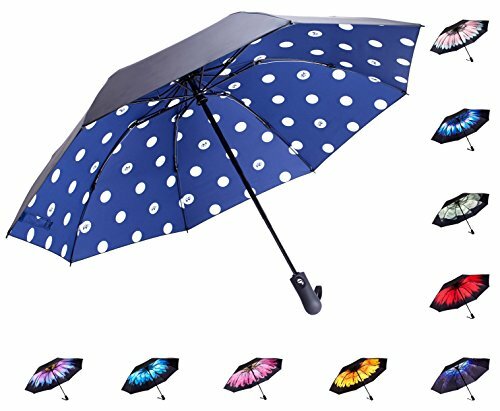 Dimensions: 21"W x 13"H x 7.5"D (Large); strengthened 9"-drop dual handles. 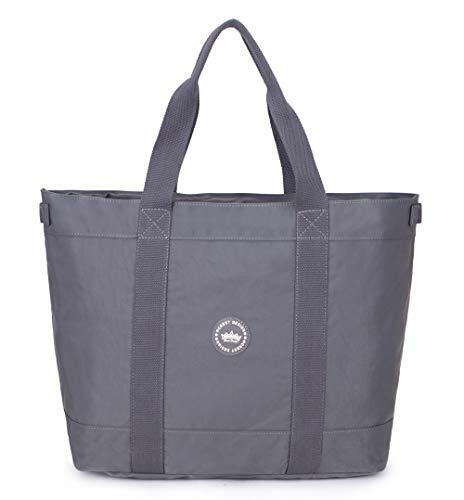 Multipurpose: perfect for laptop bag, work bag, briefcase purse, travel tote, school bag and anything from a day of shopping to a day at the beach!